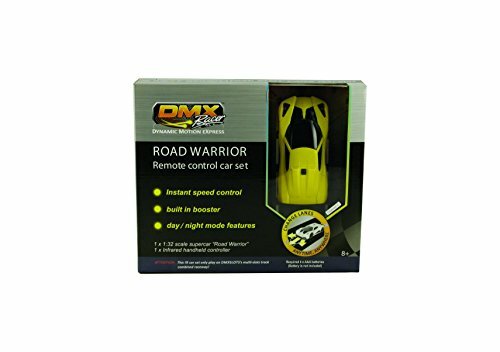 DMX Racer "Road Warrior G2" adopted new mechanism and car base design to enhance its racing performance; providing better weight balance, lower noise level and, faster response compared to the old mechanism. Product demo video can be found in our official web page dmxslots.com. Background: DMXslots is a revolutionary new concept for slot car racing. In DMXslots, car racers can pass, intercept and, block their competitors at any time and at any place on the track. Old fashioned slot cars are limited by one-pin and one-slot methodology; switching lanes can be only happening at pre-determined cross-over sections of the track; such technical limitation suppressed the development of slot car racing for nearly 100 years. DMXslots employing the unique patented "Rotating-pin Technology" allows racers to apply 3 tactics of speed and strategy to win the racing; just like real professional auto racing. Booster Tactic: all DMXslots' cars respond from the "booster" feature in the handheld controller. This shifts the car into its top speed mode, enabling it to pass or chase after other cars on the track. In an effort to add a fun factor, we limited the time usage of the booster button to a cumulative time of 30 seconds and subsequently, it automatically drops to speeds level 3 & freezes for 8 seconds before allowing it to raise back up to the top speed. Thus, choosing when to engage the booster button is one tactical strategy for racers to make. Changing lanes Tactic: Turn sterring wheel left/right to change lanes at any time and at any spot on the track's slot. You can "pass", "intercept" and "block" your competitors during the race. Cutting in on the curve at the right timing is one of the key winning strategies in a race. Speed Tactic: You may experience drifting (even 180 degrees to reverse direction) on the curve. Controlling the right speed level to achieve Slow in, Fast out is one of the tactics in DMXslots racing. View More In Slot Car Parts & Chassis. If you have any questions about this product by DMXslots, contact us by completing and submitting the form below. If you are looking for a specif part number, please include it with your message.